“The Amazing Spider-Man 2,” opening in theaters Friday,1 features many of the tropes we’ve come to expect of the modern blockbuster. It’s about a superhero. That superhero gets into a chase scene in the opening action sequence, which seems to involve half of New York City’s police force. The superhero rescues innocent people falling from buildings. Well, mostly. And he survives shootouts, explosions and a big showdown. First, here are the top genres that make up the films in our blockbuster set. IMDb breaks down genre into 20 distinct categories, but a film can fall into any number of them; the median number of genres listed for a film in our set was four. “Star Wars” (1977), for instance, was assigned action, adventure, fantasy and sci-fi.6 Of our set of 384 blockbuster films, the most popular genre was, as expected, action (177 films), followed by adventure (161 films), thriller (124 films), comedy (122) and drama (112). But genre is boring. Anyone can tell you blockbusters are typically action movies. Let’s go deeper. It’s pretty clear that superhero movies are becoming a crucial segment of recent blockbuster films. 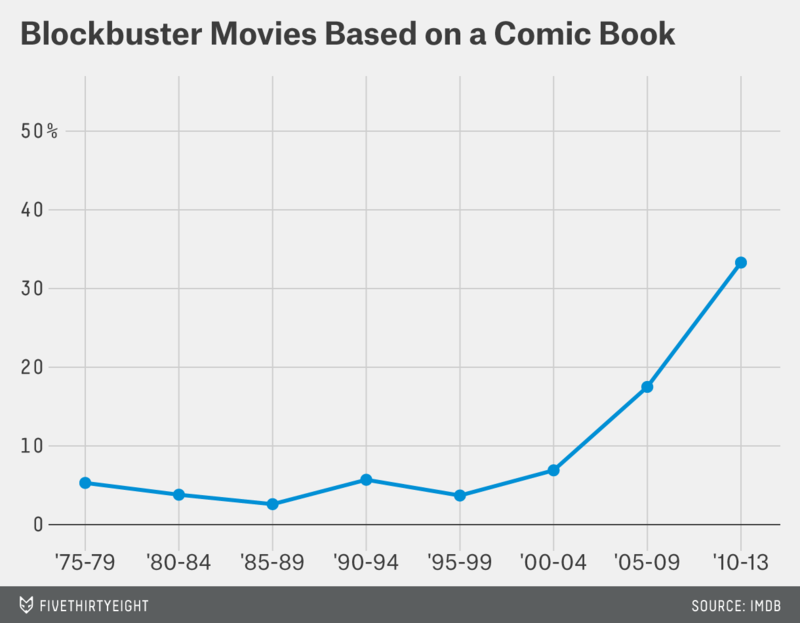 And while movies based on comic books have always been around — think “Superman” (1978), its 1980 sequel and “Batman” (1989) — they now make up a surprisingly large portion of blockbusters. “X-Men” (2000) appears to have kicked off the trend, and one in three blockbusters made since 2010 were torn from the pages of a comic book. As a point of comparison, 19 percent of the films in our set were based on a novel, and 6 percent were pulled from a television series.7 If anyone asks, “Why on earth is anyone making a ‘Guardians of the Galaxy’ movie?” this chart provides some crucial context of what the people — you — want, or at least what Hollywood thinks you want. So what are we consistently seeing in these blockbuster movies? Here are some of the new hallmarks. Even before the movie begins, you’ll see the logo of the studios that produced the film. In recent years, you may have noticed that the production companies changed their logos to match the spirit of each film. Compare, for instance, the typical Warner Bros. Pictures logo to that of the final installment of the “Harry Potter” series. Things got pretty heavy in the last “Harry Potter,” and the logo reflects that. 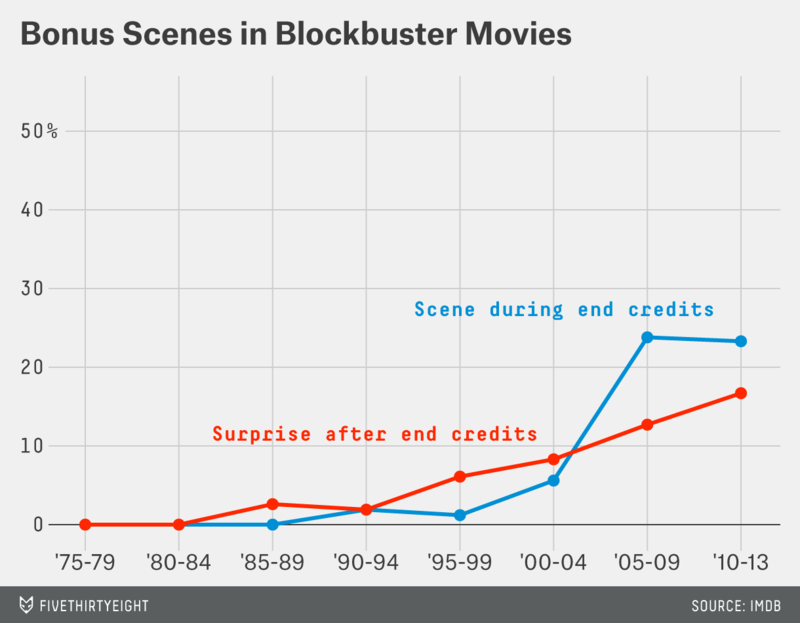 This practice has become increasingly visible in blockbusters. 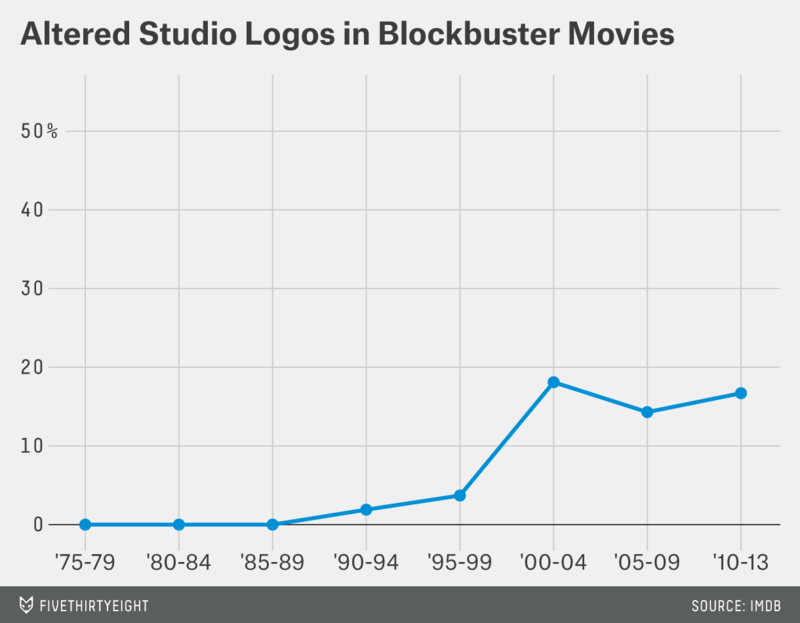 According to our data, 27 blockbusters released since 2000, or 16 percent, had an altered logo. Who started the trend? The first movie in our data set that featured an altered version of the studio logo was “The Flintstones” in 1994, not exactly what you’d consider a trendsetting work in the corpus of American film. The next movie in our set with the tag is “Batman Forever” (1995), which I consider the best of Joel Schumacher’s Batmans by a mile, and conceivably a real trendsetter when it comes to messing with the logo of the folks signing the checks. As for the very first instance, according to the IMDb database, some of the 1940s Disney animated films — “Pinocchio” (1940) and “Bambi” (1942) — altered the logo. But when it comes to contemporary films, it’s worth noting that Schumacher inherited the Batman franchise from Tim Burton, who had played around with the studio logo for “Edward Scissorhands” (1990), a film that isn’t in our blockbuster data set. Now, if we were to shoot the most blockbuster-y action scene imaginable, it would involve someone running from his enemies, who follow in close pursuit, and then falling from a building as something explodes behind him — all shot in slow motion. It would take place in the film’s opening scene or in the showdown at its close. And this person could himself potentially explode at the end of it. Right off the bat, we see that if you want to make a blockbuster movie, it’s a good idea to have a scene where one or more persons run or drive in pursuit of something, perhaps down a major thoroughfare of a city (which probably paid the producers to film there). 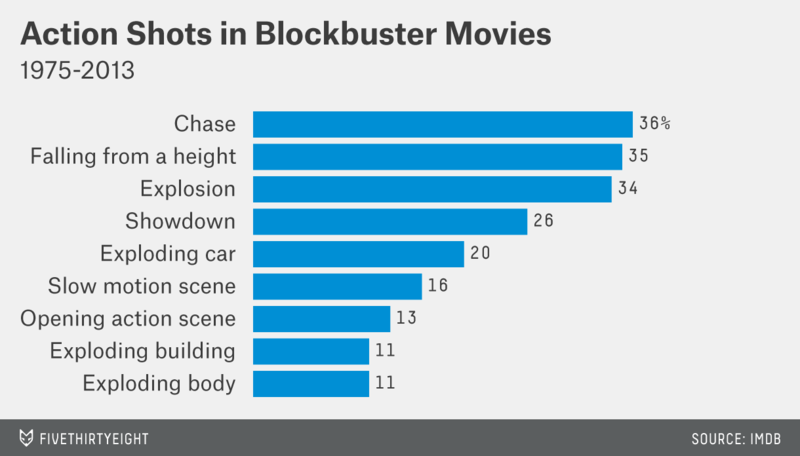 Chases showed up in 36 percent of the films in our data set and in half of the films released since 2005. Maybe a car explodes, as one does in 20 percent of the films in our set. 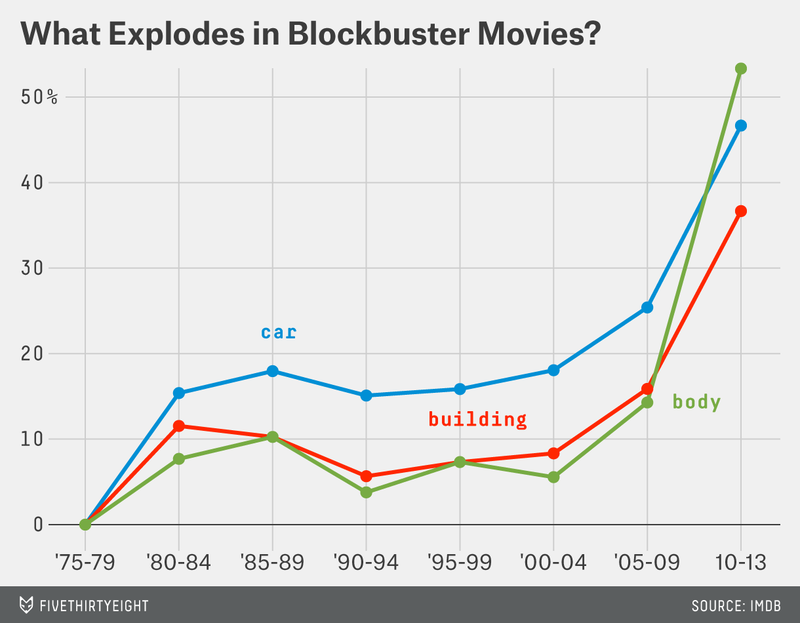 Indeed, explosions in general are critical — since 2010, 77 percent of blockbusters featured at least one explosion. Of course, action movies aren’t all special effects and people chasing each other. At some point, one character catches up to another, and then you get the showdown. And what happens then? They throw down, that’s what. Fighting is an integral part of action movies, but the type of fighting varies. In “The Amazing Spider-Man 2,” the NYPD gets into a shootout with a dude in a metal suit. This scene places the film in the pantheon of movies with a bunch of guys shooting at each other at the same time; about 30 percent of films in our set featured a shootout. More intimate fisticuffs take place in 27 percent of blockbusters, and those fights may result in a guy getting punched in the face, as he does in a solid 16 percent of these movies. Regrettably, the art of sword-fighting isn’t as common in blockbusters (occurring in 12 percent), but with new “Star Wars” films coming down the pike, we’ll again have the opportunity for elegant weapons for a civilized age. With all these bullets flying, someone eventually gets hit. But where? A character getting shot in the chest occurred in 23 percent of the movies in our data set, followed by 17 percent in the head, 13 percent in the back and 10 percent in the forehead. When characters are stabbed, something that happens less often, it’s really only in one of two places: the chest or the back. 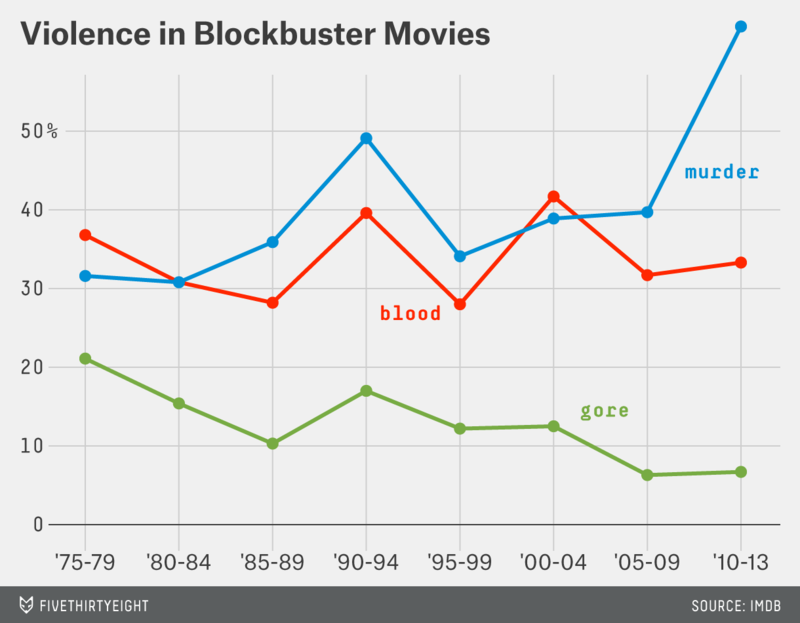 Violence is on the rise in blockbusters. While the term is rather vague, 40 percent of movies in the entire set spanning 1975 to 2013 — and 70 percent since 2010 — were tagged with “violence.” Let’s break that down into some of the tags that are typically found in violent movies. Gore is down since the decadent days of the late 1970s, but murder is up. Here’s something interesting, though. The “murder” tag and the “blood” tag largely kept pace with one another through 2004, which is to be expected, as the former often leads to the latter. Since then, though, “murder” has taken off while “blood” has remained about the same. In other words, we’re seeing bloodless murders. There has been talk about the sanitization of violence in Hollywood, and it appears to really be happening. 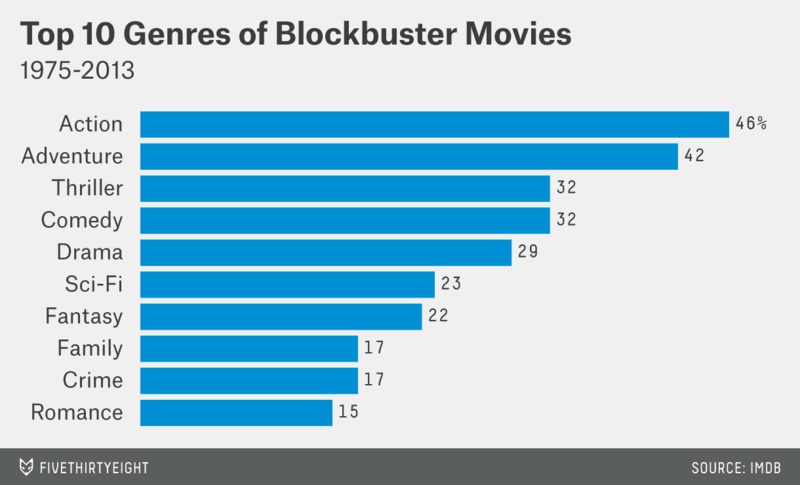 Blockbusters are killing in a clean way, from “G.I. Joe” massacring dozens without a hint of blood to major characters in “The Avengers” being stabbed directly in the back without spilling a drop. If a film wants its viewers to actually care about these people who are getting shot at, chased and stabbed, it’s got to have some central relationships. The most common relationship in blockbusters, by far, is the father-son relationship, but what’s more interesting is how certain relationships’ prevalence has changed over time. For example, father-daughter relationships were present in only 5 percent of the films in our set at the beginning of the blockbuster era, from 1975 to 1979, but were found in 27 percent of blockbusters since 2010. Husband-wife relationships, which dominated at the beginning of the era, appearing in 42 percent of blockbusters from 1975 to 1979, crashed to only 10 percent in the late ’80s before coming back to 33 percent from 2010 to 2013. How are blockbusters ending? The answer is pretty surprising. No, seriously. 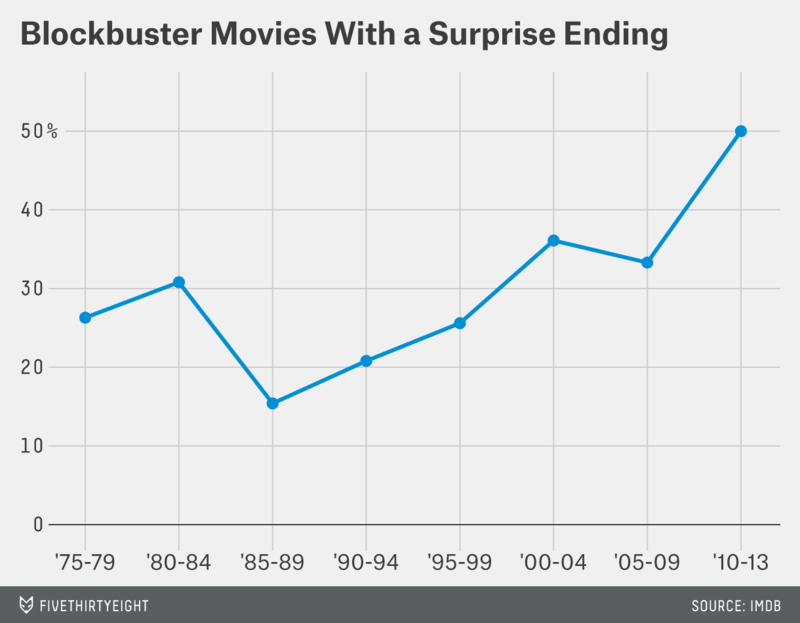 Twenty-nine percent of blockbuster films in our set were tagged with “surprise ending.” And that number in recent years is higher than ever before. This is how predictable blockbuster films are now. It’s come to the point that even the unpredictability of the plot is fundamentally predictable. When half of all blockbusters released since 2010 have a surprise ending, is it surprising anymore? So after the inevitable plot twist and the denouement, the credits roll and the movie is over. Or is it? I call this the Marvel Curve, since the vast majority of movies produced by Marvel have a post-credits treat. Who started this trend? In our set, “Aliens” (1986) was the first film to have a surprise after the credits, but according to the IMDb database, the first major motion picture to employ this practice was “Airplane!” (1980), which isn’t in our set. “Wayne’s World”(1992) was the first in our set to have scenes play throughout the credits, but that idea has been around at least since “Citizen Kane” (1941), according to IMDb. So we’re done, right? Not quite. There’s always the sequel. 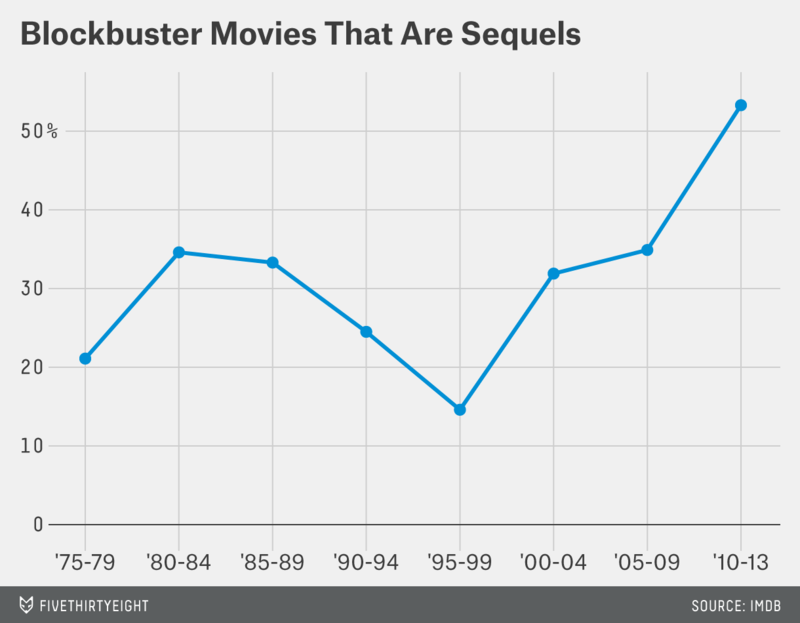 Since 2010, more than half of blockbuster films were, in fact, sequels. Why? For the same reason I’m writing this post: Blockbusters have become the cornerstone of the Hollywood film-financing system. If stuff does well, you keep doing that stuff. Just look at the movie that spurred this post. “The Amazing Spider-Man 2” is not only a sequel, it’s a sequel to a movie that itself was a reboot of a successful franchise that only seven years ago released its second sequel. In fact, there are already two sequels planned for this sequel — “Sinister Six” and “Venom” were announced last month, and presumably “The Amazing Spider-Man 3” is down the line. It’s sequels all the way down! If anything, “The Amazing Spider-Man 2” is bogged down by the fact that it has to devote so much time to setting up all those further sequels. It’s 2 hours and 22 minutes long. When Hollywood releases box-office figures for the movie on Monday, you’ll know exactly why. Disclosure: FiveThirtyEight is owned by ESPN, which in turn is owned by the Walt Disney Co., which in turn owns Marvel, which owns “Spider-Man” and also produced “The Amazing Spider-Man 2” with Columbia Pictures through the film subsidiary Marvel Enterprises. Whew. Films produced by Disney, Marvel and Lucasfilm, an additional subsidiary of the Mouse, will be referenced in this article. Information is courtesy of IMDb. Used with permission. As with any user-maintained set of data, there’s no guarantee that IMDb’s is perfect. But since we plan to zero in on some of the most popular — by definition — films of the past several decades, we’re confident that this is a solid attempt to analyze their tropes. The main liability is that films released since 2010 did have, overall, about a third more tags on IMDb than the average film. But since we’ve focused on the common tags rather than more obscure ones, that shouldn’t be a problem. The resulting set comprises movies in a relevant time period that not only have been identified as blockbusters by the IMDb community, but passed a threshold of general popularity. The IMDb database is hardly flawless, so the additional criteria give us an extra level of certainty that the movies we’re studying fit the blockbuster type. The plot keyword and ratings data I pulled can be found here. The data is up to date as of Friday, April 25, 2014. As with any user-generated dataset, the content is bound to change. The movie in our set tagged with the most genres was “Ice Age: The Meltdown” (2006) with a whopping eight: action, adventure, animation, comedy, family, fantasy, romance and sci-fi. I thought this seemed high, but think “Star Trek” (2009) and “Transformers” (2007).